Mr. Andrew Duff, Member of the European Parliament, has written to the European Commissioner for Taxation and Customs Union, Audit and Anti-Fraud explaining the so-called Spanish Equity Release Scheme (SERS) sold by a number of banks. In his letter he indicates that a number of banks and investment companies may have allegedly cheated hundreds of retired owners of Spanish property with a tax-defrauding financial product. Will the European Commission finally step in, take the time to read the deceiptful promotional literature offered by top-tier banks and make a recommendation to the relevant authorities to take action? ERVA has received a summary of the interrogation of the Danske Bank staff members from an undisclosed source. Morten Runo Waaben said that he was just the investor and came into the bank in 2006, at a later stage. Acting lawyers were not too keen on his side of the story because he was merely the investment manager, and was not involved in the signing up of the claimant. However, his version of how the investment was conducted grossly differs from the truth; he stated that it was Euan Armstrong who instructed how the spread of the investments should be allocated and that in fact, against his own advice, Euan wanted a higher risk approach. Morten also said that he was aware that Euan was an ‘avid’ investor, with substantial experience. Henrik Hjerrild Hansen went on to deny any involvement in the sale stating that although he had signing the product at the Notary Public, it was all done via Luxembourg. When lawyers confronted him on his knowledge of what he was really signing at the Notary Office, he said he was aware it was a mortgage loan but little else. When lawyers asked him about Spanish tax matters, he said he had little clue about this as that was not his role or remit, and again referred the matter to Luxembourg. Lawyers strongly confronted this statement appealing to his own LinkedIn profile, which he has now removed, where he seems ‘the’ expert in Private Banking with Danske, after 40 years of service for this entity. Finally, the lawyer for the bank, Ole Stenersen, was quite a funny chap although could not help stop lying. In his words, he was no tax expert and could not answer anything about the Capital Assurance Product. He denied knowledge of this set up and referred it to ‘someone else’ within bank. Surprisingly, when his counsel starting asking questions about this same matter, he suddenly had the answers in respect to whether a mortgage loan for tax purposes refers not to the mortgage itself, but to the loan and how it gets invested. He also gave inconsistent answers about the KPMG letter citing just one paragraph of it whilst, barefacedly, denied the other (one where KPMG states that they never authorized the tax benefits of the product). ERVA is now hoping that other victims of these thieves will wish to join the case; in connection to this. It is our determination to impede Danske Bank get away with this and we are truly hoping that this matter will go to trial. We will not finish this post without mentioning a new participant soon to be exposed, Mr. Soren Glente. Tax-mitigation fan Mr. Claus Jorgensen, Nordea S.A. Managing Director, had no qualms about giving precise indications on how to reduce Spanish Inheritance Tax by reducing the value of a Spanish property with a Luxembourg mortgage. In a letter that has arrived in our offices, Mr. Jorgensen confirmed to the Luxembourg regulator, the Commission de Surveillance, that it is better to have a mortgage than to not have one, and suggests that the Spanish Tax Authorities have confirmed the legality of the set up. We now know that this is not true. Working closely with Jesper Hertz, the ‘larger than life’ (literally too) Nordea representative in Spain commissioned with exposing the dangers of Spanish Inheritance Tax to trusting property owners in Spain, Mr. Jorgensen has managed to give out over 44 million Euros worth of tax-evading mortgages in Marbella alone, inducing customers to defraud the Spanish Tax Office by -potentially- 15 million Euros. Are the Luxembourg banking authorities going to turn a blind eye -again- to this obvious crime? They have had this letter since july 2010…can you not hear the clock ticking Mr. Juncker? At ERVA, we wish to thank N.M. Rothschild & Sons. Yes, we are sincerely grateful for allowing our members full access to ‘live’ advertising I (and II) that, introduced in a timely manner as evidence in Court, will dramatically increase the chances of succeeding in declaring the CreditSelect Series 4 sham mortage void. The advertising, which is being used as the core evidence in support of the victims’ claims that they were ripped off by the Guernsey-based bank, does not talk about investments (and needs not) but it does, an extensively so, about Inheritance Tax mitigation benefits that would come as a result of their ‘specially designed’ CreditSelect Series loans. The advertising also confirms that Rothschild sells this product “through a handful of selected IFAs”, even if now they claim that the IFAs were selected by their customers. The only advantage for Rothschild is that they are being tried in Spain, where they can lie as much as they wish! The Spanish Land Registry has confirmed that a company owned by María Angeles Muñoz and husband Lars Broberg, Crasel Panoramica S.L., took out an Equity Release mortgage loan with Nordea Bank S.A., based in Centro Plaza, Marbella. The mortgage loan capital was €3,100,000 against a property -used as collateral- valued at over 4,5 million Euros. We cannot confirm whether Lars or María Angeles are keen golfers, the prototypical victims of Jesper Hertz, Nordea Representation Office Manager, but what we do know is that the property was purchased in 2001, and the mortgage loan signed in 2010 (maturing in 2020). 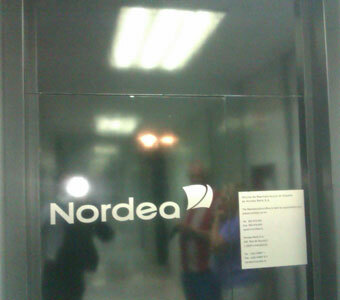 We also know that Nordea Bank S.A. has accurately explained, in a promotional brochure no longer available online since 15 days before the interim hearing in a case against them -for misleading publicity- (although cached by Google without Nordea IT ‘expert’ expecting it), how to go about the business of cheating the Spanish Tax Office. Today’s investor is more likely to have amassed a fortune through personal effort. This booklet has been devised as a basic guide for this new breed of investor and in particular for investors affected by Spanish tax and inheritance legislation. Failure to take sufficient action of Spanish Inheritance Tax (which may be as high as 34%, or even above 80% in certain situations) in the wealth-planning process, may lead to an unexpected and financially unpleasant surprise for the heirs. Fortunately, there are ways of mitigating both the wealth tax and the inheritance tax at the same time, one of which is to take up a mortgage. Borrowers may take up a mortgage loan either at the time of the purchase of a Spanish property or after having owned the property for some time. Clients appreciate our Nordic values – they differentiate us from our competitors. Our Nordic values: integrity, impartiality, honesty, directness, flexibility, commitment, treating clients as individuals, we can make the difference. It is suspected that they took out the Nordea flagship ‘international wealth and tax planning’ product , the Capital Managed Plan (CPM). The Spanish Tax Office warned against using this product to reduce Wealth Tax and more significantly, Inheritance Tax. The question is thereby one: victims or accomplices of a tax fraud scheme? If the former, they should report the bank to the authorities and where not, we must conclude that they are suspects of a potential tax fraud situation. Danske Bank International S.A. Head of Legal and Compliance claimed in Court that he could not recall if his client- the bank- gave tax advice to property owners abroad, but he thinks they did not. Also, he was adamant that the bank’s understanding of the Capital Assurance product -in respect to IHT benefits- was that such benefits would be achieved by placing the loan in a Unit-Linked offshore based insurance policy, and never by reducing the value of the property. The man, Ole Stenersen –whether through lack of sleep or a late heavy (another one) night out- was clearly confused. Firstly, he warned that he was no tax expert on the Capital Assurance scheme only to later dissect the financial product on the basis of its tax avoidance functionality. Later he said that KPMG had only asked them (DB) to remove their name (KPMG), and confirmed that KPMG never questioned the tax advice that was given by Danske Bank, which according to Ole scrupulously followed KPMGs findings. Finally, he insisted that their advertising material at no point stated that by taking out a mortgage would the customer reduce -legally- the value of the property. Not to worry Ole, we are aware the flight from Luxembourg must have been long and the trip to Fuengirola arduous and so, at ERVA, we will lend you a hand with the homework by refreshing your selective memory with an IHT manual that is actually… your own publicity. We hope you now remember better what was your employer exactly doing in Spain. (It defies logic what little respect you show for your own clients’ intelligence, your own banking system and, not the least, the Spanish Court system: if you’d been deposed in the UK you would have automatically been charged with perjury). The golfing event may be almost 2 years old but it is one of the very few photos, if not the only one, of Charles `Charlie` Walton, the creator of probably the biggest, most damaging, lie the Costa del Sol has known: the Spanish Equity Release Scheme, and all the diverse spurious variations of the same sold to hundreds of unencumbered property owners. Charlie Walton, who is now trading in gold (perhaps eager to emulate ‘Sir’ Nigel Goldman) is basically an unregistered unqualified Costa-cowboy who made millions cheating everyone, from pensioners to IFAs, from banks to investment companies, from lawyers to…more lawyers (the manipulated Uria & Menéndez report on equity release springs to mind). It is simply dumbfounding to contemplate the profesional history of man who boasts having been Sales Director for ‘Premier Group’, a company that for starters, operated illegally in Spain…not without the conniving assistance of turn-a-blind-eye Isle of Man financial regulators. We shall not end this post without giving out a word of warning: do not do business with this man…until he comes forward to help clean up the mess he and his great lie created. (Read about Charlie Walton’s recent Golf Game).